Cooke Scholars frequently cite that the most beneficial aspect of our scholarship programs – beyond receiving up to $40,000 per year – is entering a community of talented, motivated, and supportive fellow scholars. This year, the Cooke Foundation will award 75 of the nation’s top community college students with our Undergraduate Transfer Scholarship. Three of these new Cooke Scholars are graduates of Miami Dade College (MDC). Executive Director Harold O. Levy joined MDC Provost Lenore Rodicio to visit Valentina d’Empaire, Juan J. Albrecht and Yessica Maltes and welcome them in-person to the Cooke Scholar community. “I met two scholars from Arizona, Homero Sosa [Mendoza] and Luis Veloz and they were both just convincing me to apply and telling me how great the community was,” remarked Yessica. 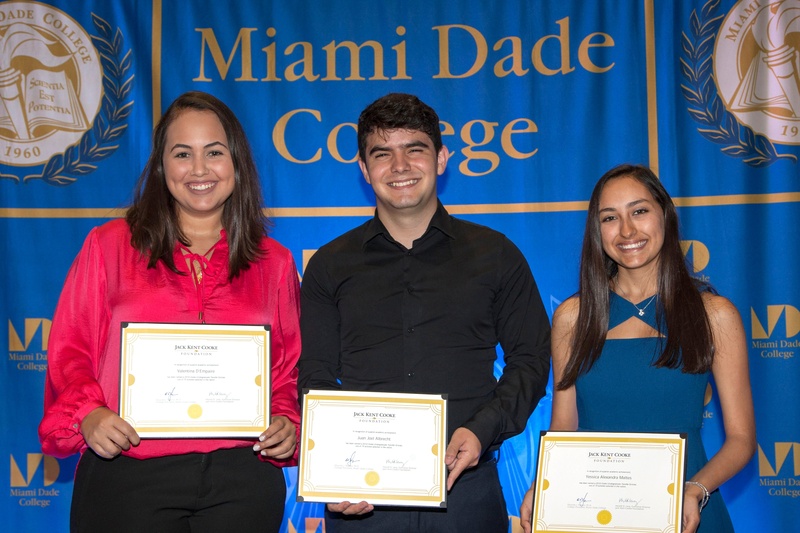 Watch the video of our celebration at MDC and hear from Valentina, Juan, and Yessica about their plans to think big, work hard, and achieve.